The good thing about Android is that it gives you access to the device’s entire file system without requiring you to “root” the phone (or tablet). Android, the vanilla edition, itself doesn’t include any file manager app but there are literally hundreds of apps in the Google Play store that fill the void and let you easily manage files and folders stored on your mobile device. An ideal file manager app should support basic file operations (copy/move/delete/rename), it should provide access to the phone’s internal storage and the SD card, it should let you search and sort files, it should have thumbnail support for media files, the app should look good on both phones and tablet and the developer should be actively updating the app. I have tested about a dozen file management apps for Android and some of these are almost as feature-rich and powerful as Windows Explorer or the Finder app on your Mac. 1. Total Commander – This is the most popular file manager app listed on the Google Play store with an average user rating of 4.9 though the interface is confusing and poorly designed. With Total Commander, you can zip and password-protect files and folders with AES encryption. 2. Astro File Manager – Astro is a unified file manager for your local files and the cloud. It can connect to your Dropbox, Google Drive, SkyDrive and other cloud storage services and you can thus easily access and mange all your files from one central app. ASTRO is ad-supported and sometimes their full-screen interstitial ads feel intrusive. 3. 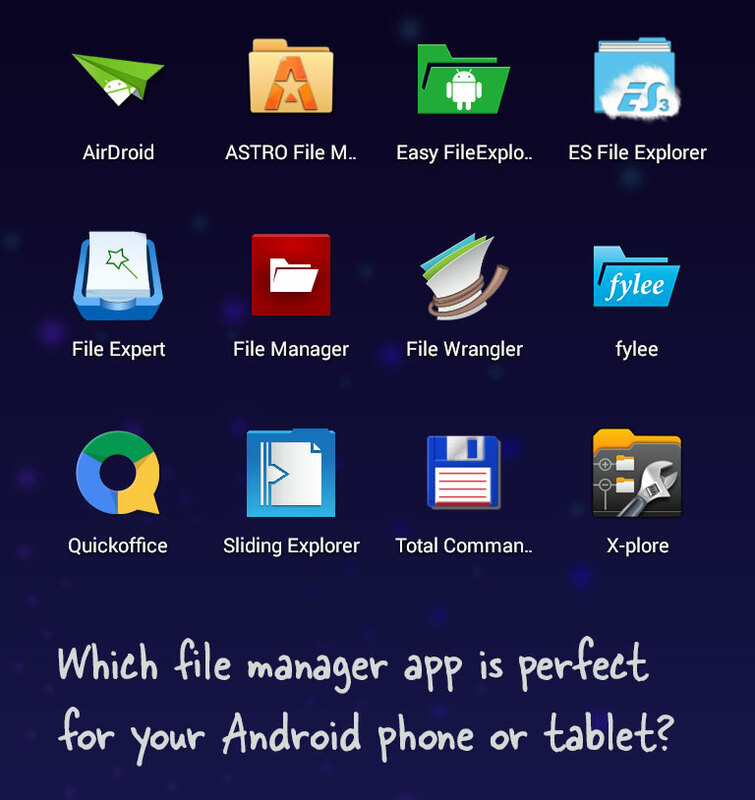 ES File Explorer – This is again a feature-rich and extremely popular file management app for Android that has a clean interface and does too many things. It can connect to various cloud services, you can also transfer files from FTP servers and shared folders on your home network plus there’s a disk analyzer app to help you discover the space-hogging files.